Irish citizens are demanding greater transparency and better service from their local and national representatives and Open Knowledge Ireland seeks to offer a means to help government to meet all these challenges. 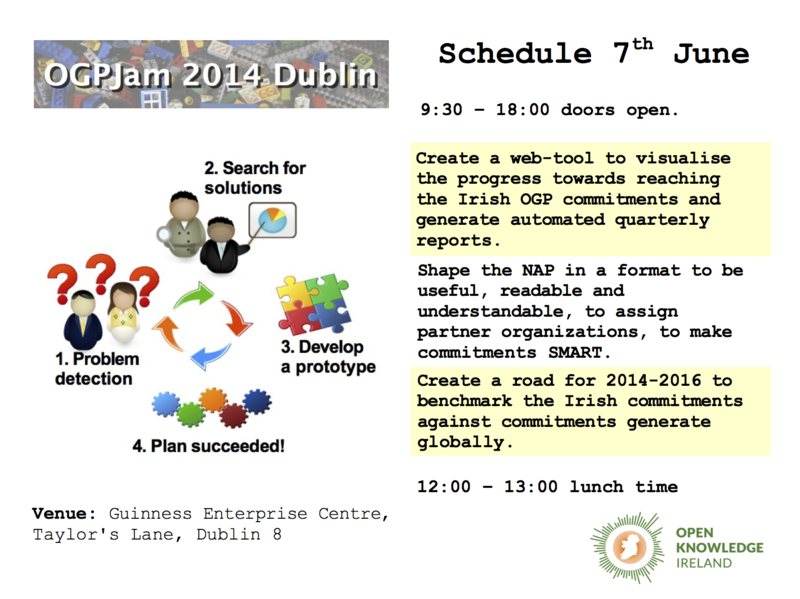 Join with us at OGPJam Dublin to collaboratively share experiences and devise innovative solutions to make public administration more accessible in Ireland. With support of the OGP, Open Knowledge Ireland is aiming at making Ireland’s 1st OGP Action Plan more concrete and specific. In the spirit of the OGP principles of citizen engagement and participation, Open Knowledge Ireland will be holding an OGPJam on Saturday, 7th June to progress on those actions. The idea is that we generate prototypes and requirements that can be shared with the Government Reform Unit, Department of Public Expenditure and Reform, who is looking after the OGP process. This event is open, encourages and benefits from the involvement of all, regardless of their occupation or background. Typically attendees may include: government employees, non-profit professionals, students and teachers, hackers and makers, etc. – and hopefully You! We are thankful to Microsoft Ireland for supporting this event. Special thanks to Dovetail Technologies for providing the venue.